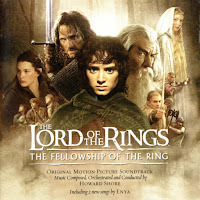 Arranjo da música "Concerning Hobbits" de Howard Shore, da trilha sonora de The Lord of the Rings: The Fellowship of the Ring para quarteto de cordas. "Concerning Hobbits is an acclaimed piece by composer Howard Shore for The Lord of the Rings: The Fellowship of the Ring soundtrack. It contains the main themes for the Shire and the Hobbits, and is intended to evoke feelings of peace. It is also the title of one of the sections of the prologue to The Lord of the Rings by J. R. R. Tolkien. The piece can also be heard briefly during a scene in the 2012 film The Hobbit: An Unexpected Journey. Although the tin whistle and violin both have solos and have the main melodies throughout the piece, it is also noted for Shore's distinctive use of the bodhrán to create a heartbeat-like sound."